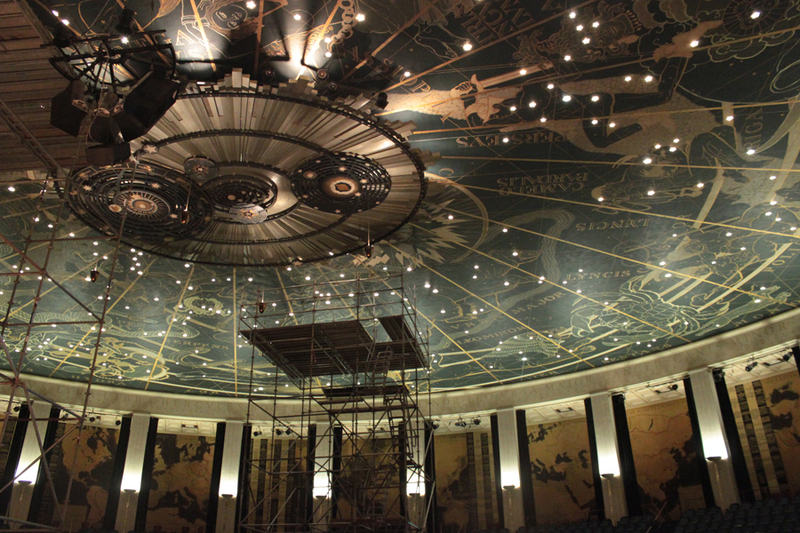 The Art-Deco ceiling murals of the Forum Auditorium of the Commonwealth of Pennsylvania’s Education Building in Harrisburg are nationally significant. They were designed and painted by architect/artist Eric Gugler (1889- 1974) and were dedicated in September of 1931. The ceiling is a representation of the constellations of the northern hemisphere with relatively accurate positioning of 1000 stars. The names of the constellations and major stars are placed around the Frieze. 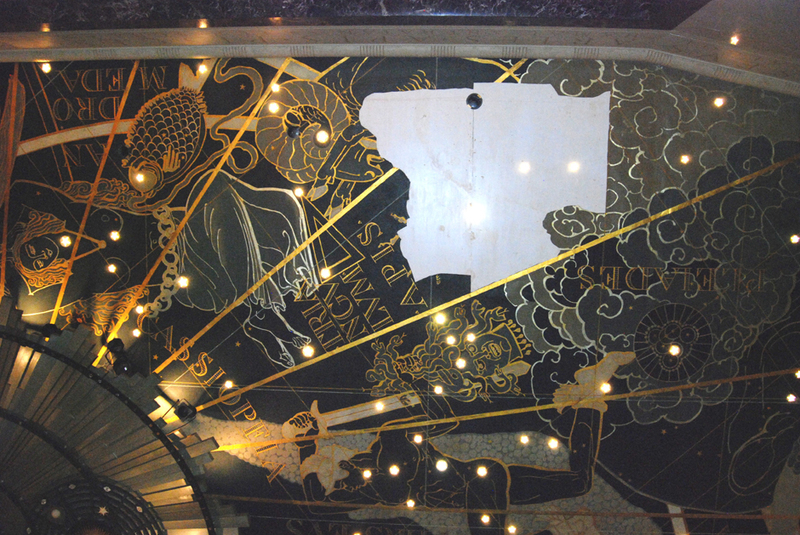 Painted figures representing many of the constellations surround each star group. 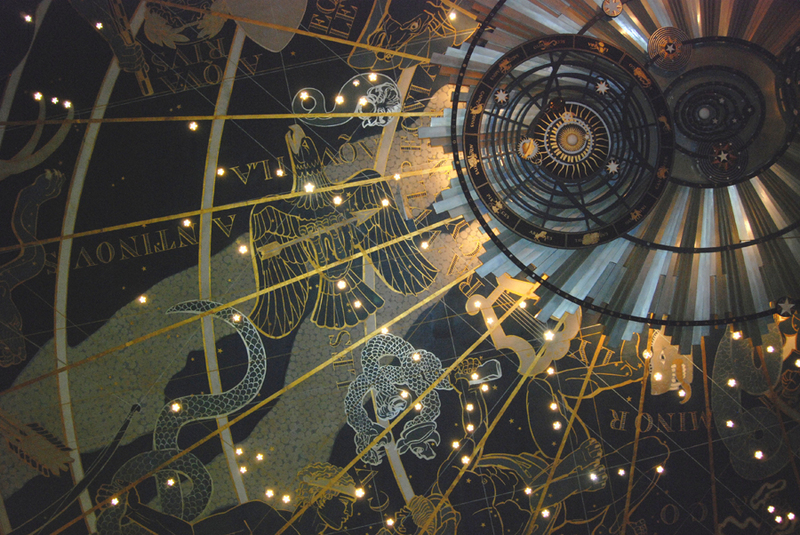 The stars are actual light fixtures in the ceiling, varying in size and brightness correlating to the actual intensity of the represented star. 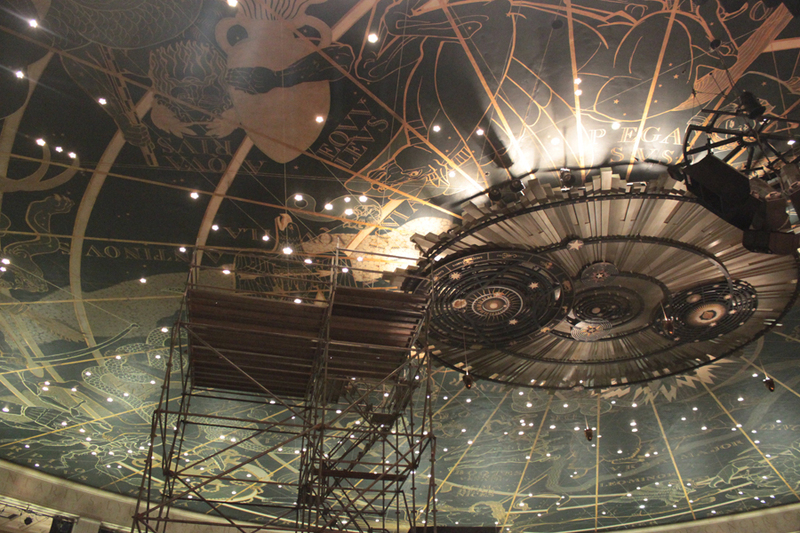 In the center of the ceiling is an elliptical metal sculptural form representing diagrams depicting the Ptolemaic, the Copernican and the Keplerian theories of the movements of the planets. Eric Gugler was a prominent American architect, artist and sculptor, born in Milwaukee, Wisconsin in 1889. He work was based out of his offices in New York. He was a personal friend of Theodore Roosevelt and may be best known for designing the oval office for the President of the United States in the West Wing of the White house in 1933. He died in 1974 at the age of 85 in Sneden’s Landing, New York. 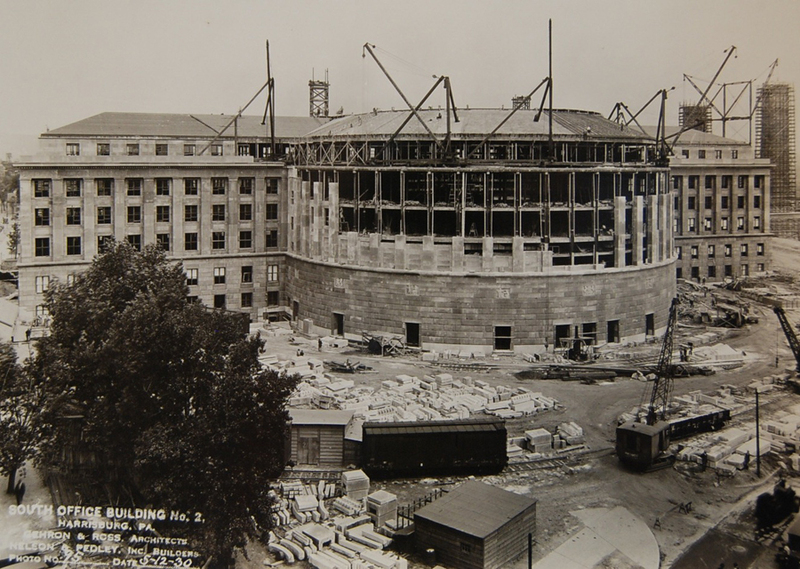 A fire severely damaged the building in November of 1930 shortly prior to completion. The fire started in the Forum Auditorium when solvent soaked rages used to remove a too thickly applied coating of lead white adhesive on the ceiling burst into flames. More than a million dollars of damage resulted from the fire. The entire plaster ceiling was redone and the hanging ceiling sculpture fell and needed to be recreated. The murals fortunately had not yet been installed on the ceiling when the fire occurred. A heavy weight plain weave canvas is attached to the ceiling with white lead adhesive, which is a severe health hazard if it becomes airborne. The adhesive was troweled onto the ceiling with a varying thickness of 1/16” to 1/8.” During removal of adhesive on canvas sections white lead adhesive was found to weigh ½ to ¾ pound per square foot of canvas, depending on the thickness of application. 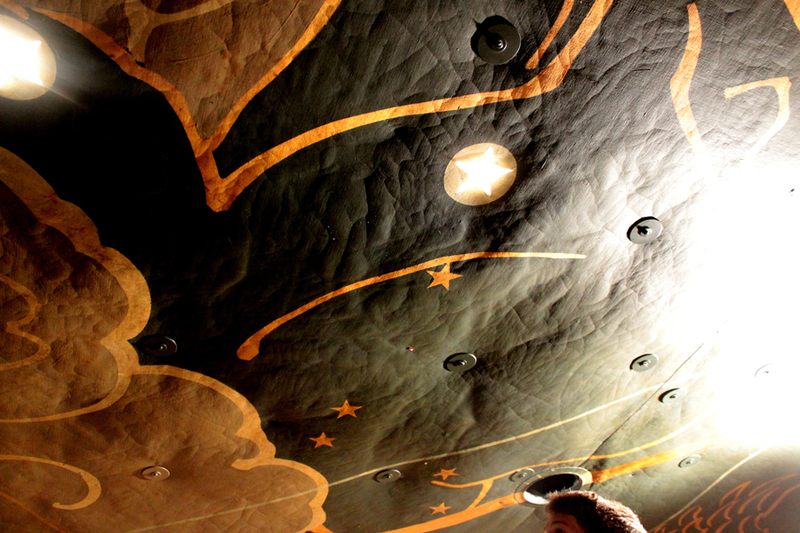 There is 50,000 square feet (250’ x 125’) of painted ceiling canvas. 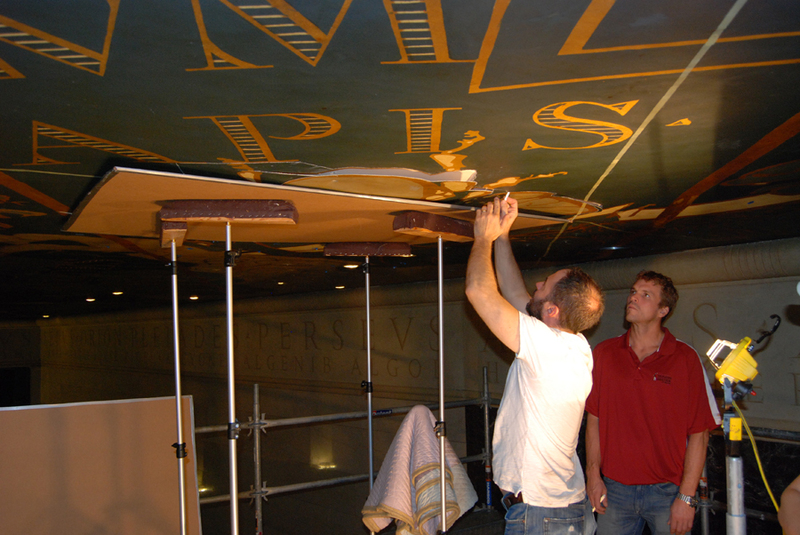 The lead attaching the canvas to the ceiling weighs between 24,000 to 36,000 pounds (12 – 18 tons). The sheer weight of the lead white adhesive on the ceiling had become a critical issue not only to the survival of the artwork, but as a hazard to the unsuspecting public below. If the canvas was allowed to continue to deteriorate because of continuing water leaks or excess moisture from above the ceiling, more problems would ensue. Where canvas had delaminated from the ceiling it appeared to have fractured between the lead white adhesive and the plaster finish coat. The canvas while still strong was at risk because of the extreme weight of the white lead adhesive, particularly where the adhesive had cracked and the canvas was supporting all of the weight of the detached sections. The canvas had torn away from some original iron tacks and had stretched in some areas threatening the stability of the paint of the mural. The paint had cracked and had quilted (convex bumps between crack lines) where it had been affected by water or moisture from above. This was a much more critical sign of long-term mural deterioration. The canvas was weak along all of the crack lines. Moisture could easily penetrate through the canvas cracks. This was a precursor to the next stage of deterioration where either the canvas breaks/fractures along the crack lines or the paint begins to flake off the canvas substrate. If moisture and water issues were not eliminated, this damage would continue to escalate with catastrophic plaster or canvas failure and the release of lead powder to the public in the future. 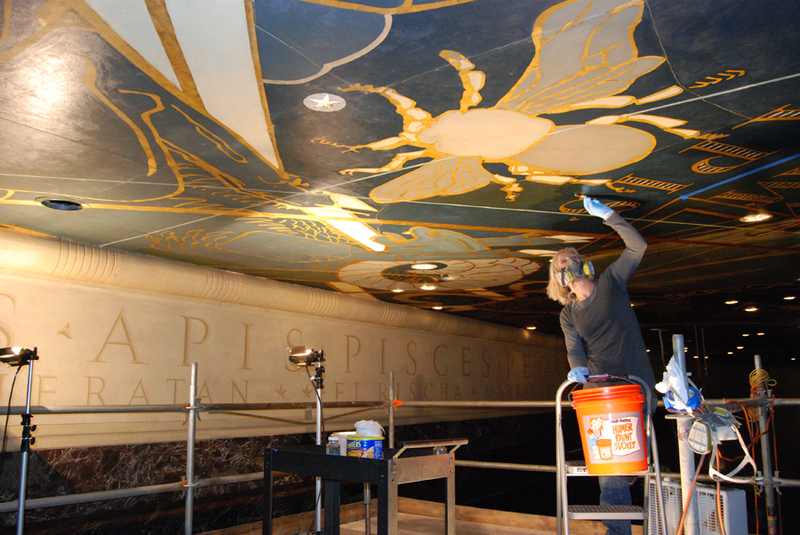 In 2010 the Department of General Services issued an emergency contract for conservation because water had damaged the ceiling murals. Leaking HVAC condensate pans and roof drains, and condensation in the un-insulated unheated space above the ceiling had caused the painted canvas on the ceiling to delaminate. The purpose of this contract was to perform emergency temporary reattachment of the delaminating, torn or falling painted canvas so that it is not further damaged until critical emergency repairs can be made to eliminate the water infiltration above the ceiling. As an integral part of this contract, each damaged area of the ceiling was professionally examined to ascertain the current extent of damage. Original construction techniques & materials were documented along with evidence of past conservation or restoration processes in order to better understand the current condition of the ceiling. This enabled us to formulate an appropriate triaged plan for this emergency conservation repair. During this contract four 40 foot high scaffold towers (30’ x 30’) were erected under areas where the painted ceiling canvas was delaminating from the plaster ceiling. Because of the extreme health hazard of white lead adhesive holding these canvases to the ceiling, containment areas were erected on each tower during phases of the treatment that involved consolidation or removal of the lead. In most instances the canvas was temporarily re-secured to the ceiling using 3” round stainless steel washers and toggle bolts. Several hundred of these cleats were installed from 1’ to 3’ apart depending on how the canvas was detached. Each of the cleats was inpainted to match the surrounding original paint (with its now discolored varnish coating). Filling and inpainting of losses were only done where damage was visible from the floor below because these temporary repairs will need to be taken out and properly conserved in the future when complete conservation of the ceiling is undertaken. Because of the continuing water leaks and condensation from above these repairs are only meant to save the ceiling artwork until the massive undertaking of roof, drainage and HVAC condensation issues can be finally be financed, bid out and permanently corrected. During this project artwork above one scaffold tower was found to be so compromised that we requested a change in project scope to remove a 20’ x 20’ section of canvas in order to remove the white lead from the back of the canvas, remove the varnish, line the paint onto a secondary canvas support and reattach it to the ceiling. Because of the extreme weight of the lead on this canvas section (200 to 300 pounds) it was jointly determined that the canvas could be cut into sections along design elements to allowing for safe removal from the ceiling and lowering to the ground. These seven sections were transported to our conservation facility for treatment. Lead white adhesive was removed using paint strippers and was removed from the canvas back with metal scrapers and scalpels. This was a long laborious process that needed to also be done in complete containment to protect the facility and the staff. 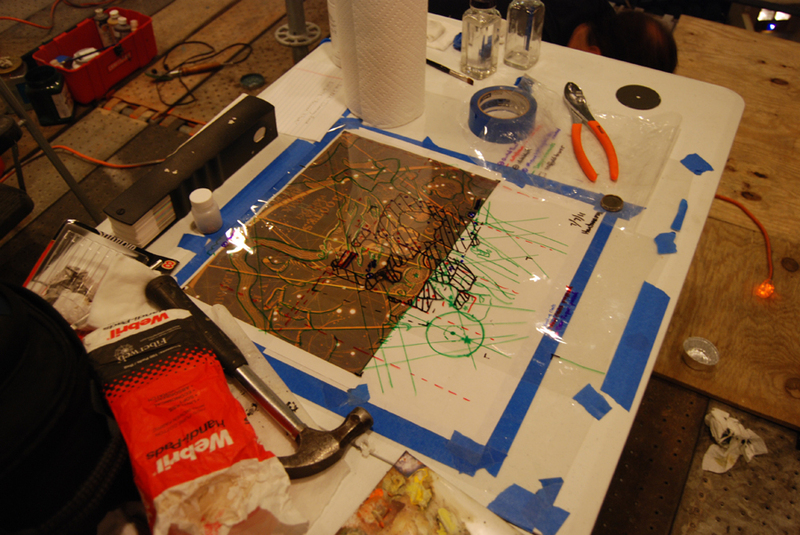 After the lead was removed, the discolored varnish coatings were dissolved with organic solvents. It was determined not to line the painting sections because the canvas was quite stable and strong and the added weight of the lining canvas wasn’t necessary. 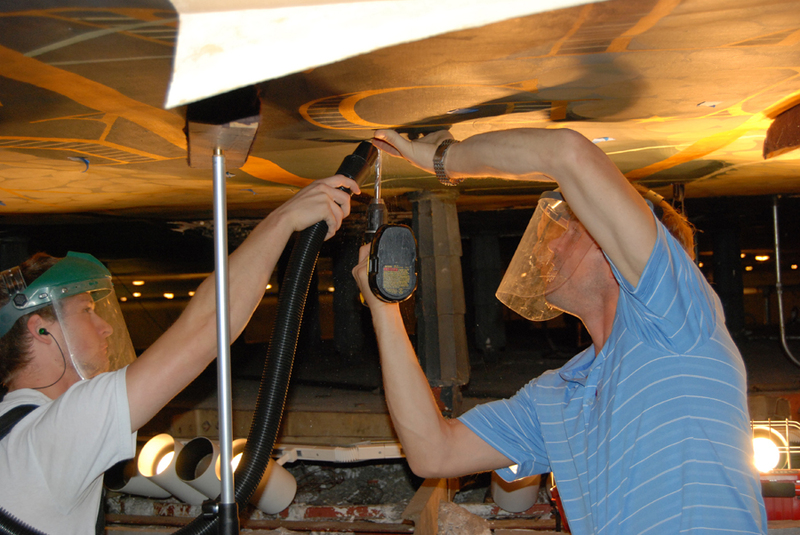 Losses in paint were filled and inpainted, and the painting sections were varnished. 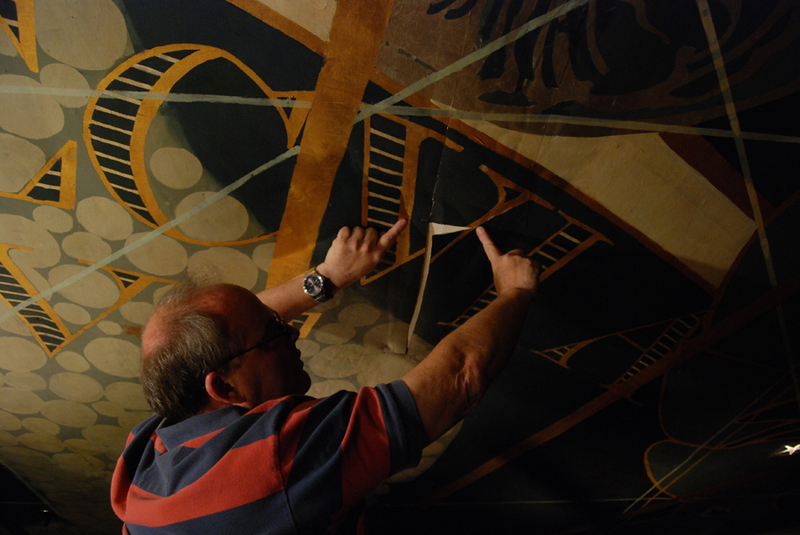 Adhesive was added to the canvas reverse in preparation for reattachment to the ceiling in the Forum. Adhesive was also added to the ceiling and allowed to dry. 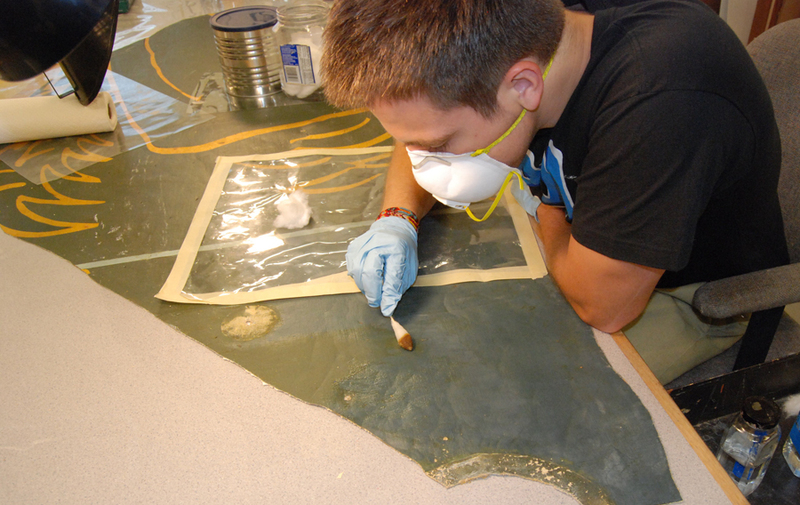 Heat from a hot air gun was used to reactivate the adhesive on both the ceiling and canvas allowed for a solid reattachment.